Originally published as a short story in The Distillery, Vol. V, No. 1, in the Winter 1998 issue, it is all true, everything happened as I describe it. The movie star in question is no longer alive. Nor is the producer. I did write the screenplay but the movie was never made. I don’t name the star or the producer not out of disrespect but because this is not about them, it is about my journey to KORR. I’m trying to pay attention to the movie star, who is talking yet again about the screenplay he expects me to write for him. It is dusk, and nearby I can hear the sluggish wallow and roll of the river, the Wuaso Ng-iro. And then the frogs start, and the crickets. We are in Kenya, very near the equator, and night comes swiftly. Just as swiftly it grows cold. I can feel the temperature drop on my skin; it’s an almost lush sensation. “With me, the best idea wins!” the movie star declares and snaps my attention back to him. He’s tall and broad-shouldered and his head is raised as he gestures emphatically. I say nothing. I know he doesn’t expect me to. Much later, after midnight, a lion roams the opposite bank, roaring in coughing gutturals. He continues until dawn when the night sounds disappear, silence momentarily veils us, and then the birds awaken. I step outside my tent and watch the first light bleach the blackness from the eastern sky. It is a simple yet sublime dawn, and the remembered sound of the lion is thrilling. Our small bush plane lands on the field at Ngoronit and lumbers to a halt near a battered Toyota Land Cruiser waiting for us. The heat is dry and the plateau is green, with scrub growth and huge eucalyptus and smaller acacias, and clusters of thick bushes, some with red flowers growing on them in mad profusion. There are craggy hills off to our left and in the distance in front of us. They are not cozy hummocks but the lower flanks of the Ndoto Mountains, dark and jagged rocks rising in miniature rifts and shallow gorges. Low trees and shrubs grow thick and pale green in the shadowed hollows. “I could set the camera up over there,” the movie star says. He is going to direct as well as star. No one is listening. The bush pilot hands the producer a gun, and then checks his own. In recent days, Somali bandits fell upon Isiolo, a sizeable town, killing five people and escaping easily. “What do you think?” the movie star asks, and everyone looks at him. The boxy vehicle rolls heavily into a broad sandy boulevard, its wheels catching in deep ruts cut by water, shifting all of us laterally for a moment before it recovers like some large plodding beast. Tall trees rise on either side, growing out of the soft carpet of pale sand to arch over us. I stand, my head out of the square opening cut into the Toyota’s roof for game watching, leaning on its leather upholstered rim. The trees are old, almost austere, the bark of their trunks dark and deeply striated, like weather-dried skin. The leaves are a sallow green, and when I inhale deeply I’m certain I can feel the air held below them, lightly cool and dry. The woman driving is named Matty. She is small and wiry and her sinewy arms are sunburned. 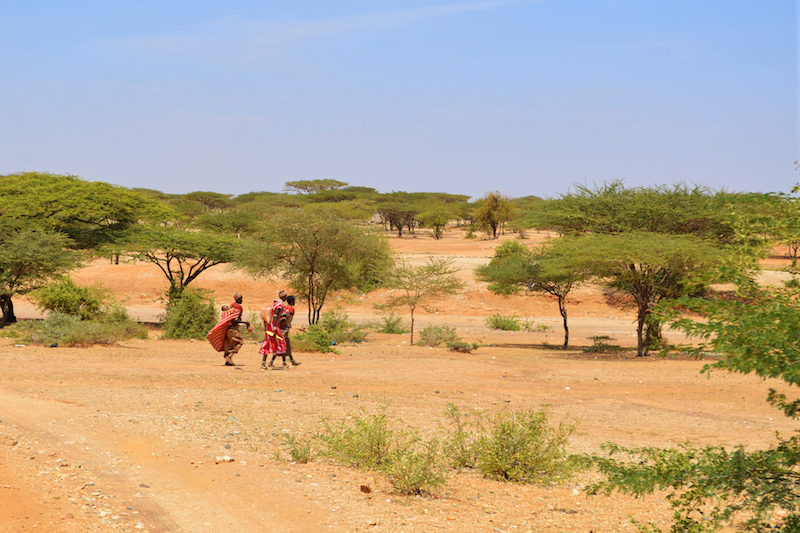 To avoid going through Isiolo on the way here to meet us, she took the long way around while we flew. The flight took a little over an hour. Matty has been driving for two days. She points and far up ahead at the end of the wide alleyway I see a small white wooden house. It is a church, she is telling the movie star, a mission. A priest visits once a month to conduct services. I want to stop and go inside and walk around, but the movie star says there is no reason. We pass by and as we do I imagine the wood floor clearly, the dry and dusty smell and then the sound of my footsteps. There’s a small settlement off to the left of the church, a few mud-wall huts and a well in the middle of the wide track which runs through the settlement. Here the trees feel lower because their spreading branches form an umbrella of soft shadow. Goats wander in and out of this dappled darkness. A broad puddle has spread across a part of the track, glistening and ignored. It’s water from the well; people lower their clay and tin containers down into it and fill them, then raise them up to the well’s lip and haul them over its side. The overflow spills indiscriminately. The movie star immediately decides that this will be the place where Somali bandits attack. When they depart, I suggest the well should be left clogged with dead bodies. It is not unlikely, I add. We return to the landing field and it is much hotter. We are to continue our location survey by flying north to what we have been assured is a truly desolate place, in a much harsher setting. The producer says it’s called Korr and the movie star is eager to get going. But now, with Matty and her tracker, we are too many for the plane to take off. It is not a question of room, or having enough cleared air strip to achieve lift off. It’s the heat; with the additional weight the hot air, pressing down on the plane’s wings, will hold it on the ground. It is decided that we will drive. The plane will meet us. “You know where it is?” the pilot asks Matty. “I’ll find it,” she replies. The pilot crawls into the cockpit and returns with a huge map, crushed and wrinkled, its seams splitting. He opens it up and spreads it on the ground in the shade of the plane’s wing. I pay little attention as the pilot’s hand finds a place on the map and then moves up it on a sharp diagonal. “Somewhere about here, I reckon,” he says. I wish I had looked closer. “Let’s do it,” the movie star says impatiently and climbs into the Land Cruiser. The producer and I follow him and then Matty drives to the end of the cleared runway. She stops and turns as the pilot brings the small plane around at the other end and fixes his line of takeoff. He revs the two engines, the sound of their rising revolutions drifting down to us where we wait. Then he releases the brakes and the plane gives a small convulsive start, moves into a steadier roll, and then picks up speed. The tail quickly lifts; moments later so do the front wheels and the plane is airborne. Matty restarts the Toyota and we set off. The road, what there is of it, is like an ancient river bed, its sandy course defined as much by crumbling striations where water may have flowed as by the faint traces of tires. The shadows and green of Ngoronit are gone. We are moving out onto the Kaisut Desert. In all the distances, jagged hills sit anchored like pieces of rock dropped from such a great height that they shattered upon impact and then dug their way deep into the barren plain. Green mattes their flanks, a dusky ancient green. We move at a steady speed and I’m standing up once again, ducking my head as we slide under the overhanging acacia branches, my eyes closing each time. The acacia leaves are small and sparse on the many branches. There are many more thorns and they are large, their shafts dark and gray, their points a dull silver. Some are bleached white. I expect them to glisten, announce themselves and warn me off. But here, whatever there is already knows. We glide around a broad curve, its arc a bend made more by old waters, and find ourselves in a dry wash, the sand reddish and packed beneath our tires. I feel the change, not physically, like a change beneath us which quivers up through the vehicle to my hands holding the rim of the opening and my feet where I stand, but in the simple disappearance of any sign of the road. I’m free, moving along something beyond a choice of human direction. For a moment I am alone. The settlement, the manyatta, appears suddenly in what has been a profound emptiness. We stop and the wind in my face stops and I see the dry thorn bushes which encircle the sprawled scattering of squat dark huts and in the same moment I again feel the sun and the heat and the skin on my arms, dry as a sound I might hear. We get out of the Toyota and walk toward the manyatta as a group of women cluster loosely and then move away from the dung-roofed huts towards us, goats parting before them. A breeze touches my face and I suddenly smell the place; it is something old and strong, pungent and leathery. I start across the wide track which we have been following and step onto the ridge of a gouged-out rut and sink down with the soft sand that settles beneath my weight. It holds my foot and I do nothing. Through my shoe I feel the heat held in the sand. There’s a chest-high opening in the thorn bush enclosure and we step inside and the women surround us. The ground underfoot is packed hard and dry and is the ancient color of the huts and the skin on the backs of the hands of the women who watch us, their gazes wary and uncertain. They wear loose leather skirt-like coverings cinched at their waists and they are bare-breasted. Some wear stiff thin leathery circular bands stacked high around their necks, elongating them, raising their heads to give them something almost noble. The movie star’s hand remains on the tiny dark head, almost concealing it in benediction. “Her baby has malaria,” he says somberly. The movie star looks around, as if trying to absorb it, draw the moment into himself. His hand is still on the tiny forehead. “Can we shoot this?” he asks. “No,” I hear myself say. The movie star seems not to be listening but the producer looks at me. “We can shoot this,” the movie star answers his own question and lifts his hand off the baby. “Thank you,” he says gravely to the mother. I walk away from him and the others, across to the far side of the manyatta. I turn back. The women cluster around our group, the movie star towering over everyone. They all look far away; not from where I stand, but from me. I can smell acrid smoke and the bite of stale animal droppings. I believe I am truly there. We leave and I am once more standing, my head up through the vehicle’s opening. Behind me, the women move about the manyatta. None of them looks after us. One steps through the small opening of a hut, disturbing the smoke which drifts out. Ahead of us, the low thorn bushes on either side of the road are a dry green, dusted and pale. There are clumps of prairie grass, very dry and very old, and the ground is harder. The few acacia trees are lower, their branches twisted and spare, gnarling the air itself. There is no sense of shade. I turn my head and look back. The manyattais gone. The terrain changes, empties of everything including color and becomes rocky ground and sparse clusters of dry twigs jutting out of the ground. We sway along through the desolation, all our horizons pulling further and further off, abandoning us. “Where are we?” I ask, but no one hears me. It doesn’t matter. Knowing a name would give me nothing. I am in a moving vehicle and whatever we pass, or is passed by us, is replaced by the same place. I may as well be motionless. I am going nowhere and the realization is suddenly frightening, and wonderful. I am unnecessary to this place. We rock down the side of an incline into the wash of a dry river bed which cuts our track laterally. On the other bank, a large bird sits in the upper branches of a dead tree. It has a bare face and shaggy neck feathering. It is the first living creature I’ve seen since the goats in the manyatta. “Egyptian vulture,” Matty calls up from where she drives, gripping the wheel with her small strong hands, steering us across the rocky and sandy river bottom to the incline of the other side. We start up it, watched by the vulture as we stall momentarily. Matty drops into a lower gear and guns the engine. It makes a loud laboring whine and the vulture takes off in a slow heavy flapping of broad wings. It lifts higher and a rising thermal catches it and its ungainly movements disappear and become something smooth and liquid. We heave over the top of the rise back onto the track and I shield my eyes and watch the vulture for a long time, soaring higher and higher in ever-widening circles. The surface of the road becomes crumbled rocks, ungiving beneath our wheels, jolting us. The sun is more brutal than the landscape through which we move, scorching the rock-strewn emptiness. And then ahead of us I see a slender boy, naked save for a loin cloth, following a donkey and swatting it from time to time with a very long and very thin stick. I don’t understand what he is doing in this cruel wilderness but when we pass I wave. The boy looks at me, puzzled. The Toyota lurches and I turn away from him and grab for support. A series of boxes and rectangles on the horizon become small square houses, some of them on the shallow rise of a barren hill, others in a flat broad valley of crushed rock. “Korr,” Matty announces with a small gesture. There’s a distant tree line suggesting water. And some huts even cruder than the ones in the manyatta. We stop in front of a box-like house which has an open doorway but no door. Several old men in loose robes thrown over one shoulder and down around their bodies lean or hunker against the building’s outside wall. One of them smokes something, a stub trailing smoke all that remains in his mouth. There’s a sign over the doorway and the interior is dark because there is no electricity. A woman emerges, naked above the waist. Her neck is encircled by a thick pile of the thin dark-brown bands and she turns her head and then her shoulders to consider us. It is very quiet and I realize Matty has turned off the engine. “Where are we?” I ask. “Where is the plane?” the producer asks. “Who flies him down?” the movie star asks. I try to imagine someone doing that, moving back the way we have come, seeing what I have seen, being able to see it and be a part of it. The tree line we saw surrounds a lone well. Women crowd around it and watch an almost naked man descend down the sides of the wide opening which has become terraced with time and the weight of others like him. His black face, back and chest are a dry streaked wash of ash-white dust and sand. He reappears with the end of a rope which he takes up. A large tin container is at the other end of the rope, brown water sloshing around in it. He raises it over his head and one of the women catches the container and lifts it the rest of the way. She empties the water into the earthen jar at her feet and then passes it to another woman, who fills her jar. The pilot comes up, wiping his face. “How was the drive?” The movie star turns. “Some amazing land back there,” he says. “This—,” he gestures at our surroundings and shrugs with barely charitable regret. “It’s up to you,” the producer says. “We don’t need it,” the movie star says. The man in the well disappears back down into it, dropping the tin container before him. I wait to hear a splash. Three women wait on the rim, watching us. “Kwa heri,” the movie star says and raises his hand to them, palm up and out. “Thank them for me,” he says and smiles at her and then back at the women. The movie star gives them a gracious wave. The women continue to stare. At the far end of the small rocky-strewn runway, Matty leans on the front of the Toyota, her head turned to us in the plane. Once we are in the air, she will drive home. In East Africa, no one leaves a bush landing strip until a departing plane has safely taken off. The pilot revs the engines and we vibrate in their grip. The whine rises and then several sounds separate and suddenly join and become one. At the same moment, the pilot releases the brake and we begin to move. Out of my window I see two women walking on a line diagonally away from the runway and our moving plane. Their pace is steady and one looks back at us over her right shoulder. She has a child on her hip. Her companion embraces a clay pot with both hands. Both wear long loose skirts of pale-colored cloth, their bare breasts moving rhythmically beneath the bands around their necks. We pick up speed and I see that in a moment we will be even with them, even as they continue walking off on a tangent in the direction of the well. They are going for water and we are leaving. The one woman is still looking at our plane, watching our progress; I think she is close enough to see me framed in the plane’s window looking across at her as she and her companion continue walking. Their pace is measured and easy, and I suddenly feel the momentum of the plane brush, briefly hold, and then just as quickly lose the cadence of their advance. I feel it within me, a fleeting sense of rhythm and motion even as we pick up more speed and the plane’s tail lifts. It is too sudden for me. I want this moment to continue; though we pass through time I want to hold on. I do not want to lose the space which links me to the two women and to this place to which they belong. It and they are unexpectedly and intensely real, and beautiful. I want to stay, desperately. Then something makes me turn. In the cramped cabin, the movie star and the producer sit close, heads closer. The producer nods as the movie star’s hands form a series of small picture frames, and I understand it no longer has anything to do with me. Outside, we are already past the women and up ahead Matty stands in front of her Toyota, arms folded, watching us moving faster and faster toward her. I look back at the two striding figures and see their progress continue on its calm diagonal, away from us. Our speed continues to increase and I am losing them. It is more than the widening distance, and the time passing with our physical passage. And then the woman with the child on her hip turns her head, away from me and the plane. She and her companion are moving off and the plane is lifted and rises with sudden steepness. A wing tilts, drops, and we bank, away from everything below, a lazy turn which goes on and on as we continue to climb even as the sound of the engines changes and grows shallow. Then something seems to catch and draw us ever higher in a circle that grows wider and wider. I close my eyes and tell myself I am merely in the grip of some thermal. But I know I am leaving forever and there is nothing I can do even as we rise up out of the Chalbi Desert with a soft rush I can feel. When I returned to New York I wanted to find Korr on a map, see where I had been. Road maps of North-Central Kenya didn’t show it. Nor did any of the more detailed maps I searched. I kept looking and came across the Gazetteer for British East Africa, prepared in the Office of Geography, U.S. Department of the Interior, and released in April, 1955. There was no Korr, but I did find a place called Kore, with the word Wadi after it, location 3.28o N., 37.15o E. A wadi, I learned, is a watering place. Then I found Koreh, location 0.02o N., 3843o E, WTRH after its name. Waterhole. I heard about an aeronautic map published by the U.S. Defense Mapping Agency Aerospace Center, St. Louis Missouri, specifically the segment designated ONC L-5, which covers north-central Kenya. I tracked down what was then the most recent edition and recognized it as the map our pilot, the late Dave Leonard, had used. Almost immediately, I located Ngoronit. It is at 3200 feet above sea level and on the lower edge of the Kaisut Desert. Using the coordinates from the Gazetteers, I find Kore and then Koreh. One is south of Ngoronit. The other is to the north and west, close to Lake Turkana. But from Ngoronitwe had driven north-by-northeast, overland into the square formed by 2.00o and 3.00o North, and 37.00o and 38.00o East. Eventually, we came to Korr. On the huge map, its scale 1:1,000,000, there was nothing.